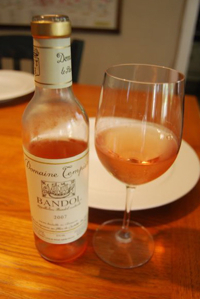 Rosé wines, also known as blush wine, is a wine that is somewhere in color between a white wine and red wine. While they can vary in color from pink wine, to salmon, to light red, rose wine doesn't quite fall into either the white or red spectrum. In general, rosé wines are meant to be fresh, refreshing and tasty wines that are not too serious. By that we mean that while most blush wine is not as deep or complex as the best white or red wines, they are all about simple pleasure and definitely deserve a place in your wine drinking repertoire. They tend to be on the dry side but some have a bit of residual sugar to enhance their fruitiness. When people think about rosé they often think of one of the most widespread wines in the US, so called White Zinfandel. For whatever reason, this wine, as well as the newer fad "White Merlot", are generally not indicative of the pleasures that a great rosé can give. They tend to be bland, insipid wines with little flavor, no structure and too much residual sugar, leaving them slightly cloying and boring. Do not include these wines in your search for great blush wine. Instead, focus on the classics. Many regions now make good rose wine, including California, but some of the best come from the sun-drenched Mediterranean coast in areas like Provence in France and various parts of Italy and Spain. These rosés can help impart the fun and carefree attitude of those regions into your dinner party. Learn about Dry Red Wines and Dry White Wines. Rosé, sometimes called Rosato in Italy or Rosado in Spain, is generally made from a blend of red and white grapes or just red grapes. The color imparted to red wines is from the skin of the grape, not the juice. So the wine is only left in contact with the red grapes long enough to pick up a small amount of color. The resulting pink juice is then fermented as usual for most types of dry wine. As mentioned above, blush wine can vary considerably in color as well as flavor and complexity depending on the grapes used, the region it comes from and the producers style. However, most are meant to be refreshing wines that are served slightly chilled and have lively fruity aromas and flavors. They can be a great summertime wine for warm afternoons. They make an excellent apéritif and actually pair nicely with many foods, particularly salty finger foods like tapenade spead, olives, bruschetta and some cheeses. For more tips and information about pairing wines with food, be sure to check out our Food and Wine Pairing section! To celebrate the joie de vive that is found around the Mediterranean coast, pour yourself a yummy glass of rosé and sit back and relax with friend! Done with the Blush Wine page?